Selecting the right wheel components can have a profound effect on the performance, maneuverability and comfort of your wheelchair. There is more to a wheel than just being the part of the wheelchair that gets you from point A to point B. How and where you use your chair will make a difference in which wheel accessories you will want on your chair. Wheelchairs typically have two sets of wheels – two large ones in the back and two smaller ones in the front. However, some everyday and specialized sports (e.g., tennis) wheelchairs have only one small wheel in the front and some high-end power wheelchairs have three sets of wheels (six altogether)! A wheel consists of theses components: tire, rim, pushrim, spokes or MAGs, and a hub. The tire is the only part of the wheel that makes contact with the ground. It is not uncommon for manual wheelchair riders to have a couple sets of tires to accommodate for season or climate changes. For most manual wheelchairs that you self-propel, the rear wheels are the largest. The rear wheels are generally referred to as the "drive wheels" because they have pushrims attached to the rims of the tires that are used to help push the wheelchair forward. Invacare Tracer: Urethatn rear tires, mounted on "no flex" wheels, offer superior performance. Wheelchairs designed for an attendant or caregiver to propel (typically seen in a hospital or long-term care facility) may have larger tires in the front since there is no need for "drive wheels." This feature inhibits you from being able to independently propel your own wheelchair. There are several factors to consider when choosing the most suitable wheel and tire configuration for your wheelchair. Many wheelchair frames cannot be modified to accept all the sizes of wheels and tires that are available. Therefore, if you are replacing a wheel, you should check your purchase record to determine the specific configurations available for your particular model wheelchair. The wheelchair’s serial number should help you find the right tires if you have not changed from the original wheel configuration that came from the factory. It is also helpful to have the seat width and depth as well as the frame color of your chair to make sure that SpinLife.com has the right wheelchair information from the factory. The tires are what can go flat and what can make your ride more or less shock proof. There are two classes of tires -- pneumatic (air) and puncture-proof -- and how you use and where you ride your chair will help you decide which is right for you. These are commonly made of rubber and require an inner tube which is filled with air to a recommended pressure (pounds per square inch or psi). If you want higher performance, a combined tube and tire (e.g. sew-up) or a Kevlar® (material used to make bulletproof vests) tire with a high-pressure tube (e.g., 180 psi) may be more desirable. Pneumatic tires are widely used on most manual and power wheelchairs because they are generally lighter, shock-absorbing and offer good traction on most terrain types. While pneumatic tires are the most popular kind, they require the highest degree of maintenance. This is because the air insert consists of a thin liner that can be easily punctured by thorns, nails or other sharp objects that penetrate through the tire. With these tires, you must always be prepared for encountering a flat-tire, especially if you spend a lot of time outdoors. You can learn to change your own tire, or you can go to a local bike-shop, attendant or friend who is familiar with bike and/or wheelchair maintenance. In addition, you must keep a close eye on maintaining the appropriate pressure level since air tends to leak out of the pneumatic tires over time. Tires need to be replaced when the tread on the tires have become worn or cracked. If the inner air tubes have been punctured, they can be reused if you patch the tear with a "patch kit" but should be replaced every couple months to reduce the incidence of flats due to wear. These are made of rubber or plastic (e.g., usually polyurethane). 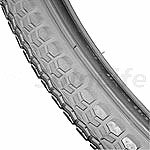 The rubber puncture-proof tires are similar to the pneumatic kind, but the inner tube consists of a solid material such as foam, plastic or rubber. These tires are essentially flat-free and require less maintenance then the pneumatic rubber tires. However, a single solid insert is generally heavier by an average of 1.5 times that of a single pneumatic insert. The combined difference in weight between having two pneumatic inserts and two solid inserts is approximately two to four pounds depending on the material. While this doesn’t seem like very much, this additional weight can have a significant impact when it comes to transporting and propelling the wheelchair. They are also stiffer (not as shock-absorbing) and tend not to grip the ground as well. These features may adversely affect the performance of your wheelchair if you spend time outdoors in slippery conditions, if you commonly travel up and down inclined surfaces and/or if you propel upon rough and/or rocky terrain. Replacing a solid insert can be very difficult to do on your own and should be taken to an authorized service center. Unfortunately servicing a wheel can be expensive. Most wheelchair dealers will charge by the hour and the cost ranges from $30 to $50 per hour. Changing a tire with a solid insert takes a little longer than a pneumatic insert so you can expect the cost for service to be higher. Bicycle shops can also provide repair or installation services on most wheelchair wheels and tires and are generally more economical. Labor costs are around $5 to $10 to change an insert. There are also puncture-proof tires that consist of a solid plastic (no inserts). These tires are generally the least expensive but are also low performance, greatly reducing your comfort and can become damaged rather easily. 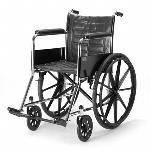 Solid plastic tires are commonly found on depot (hospital) wheelchairs that are designed for indoor usage. New technologies have enabled puncture-proof tires to become more lightweight and comfortable for the user while still providing for longer wear times. These tires typically are constructed of a semi-pneumatic foam and/or rubber combination and come in various tread designs and sizes. Pneumatic tires and tubes are the most inexpensive combination to purchase. For a standard 24" x 1 3/8" or 1 1/4" tire (most common rear tire size for self-propelling manual wheelchairs) prices range from $10 to $45 per tire and mostly depends on the materials they’re made of. The more inexpensive tires are made of a lower grade rubber with simple wire reinforcing bead (holds the tire inside the rim edges). The more expensive tires are made out of a higher quality rubber while reinforcing on the sidewalls and bead is made out of a Kevlar® material. Tires with heavy tread and high-pressure tires tend to be more expensive also. The costs of pneumatic tubes also depend on material. A standard rubber tube can cost anywhere from $3 to $7. A pneumatic tube consisting of a higher-grade lighter-weight material such as latex is around $20 each. The solid and semi-pneumatic tires and inserts are in the range of $10 to $50 each. In general, puncture-proof inserts made of hard plastic are cheaper than those made of foam. Tires are available in many different tread designs and widths to accommodate almost any type of terrain, as well as your mobility needs. Treads range from very smooth to extremely knobby, such as those typically seen on high performance mountain bikes. The smoother the tread and the skinnier the tire, the less rolling resistance you will have. The lesser the resistance, the lesser the force or energy that is required to push your wheelchair. If you spend a majority of time indoors, a smooth to lightly treaded skinny tire is most desirable. However, if you spend a lot of time outdoors, a wider tire with a medium knobby tread is more appropriate so you have better traction on rough surfaces. There are special tread designs and widths available for traversing over snow, dirt, turf and grass. Power wheelchair users tend to have medium treads and thicker tires on all the wheels to accommodate many different surfaces and the weight of the wheelchair/user. Smooth treads aren’t a consideration since rolling resistance is not a problem when the wheelchair is powered with electronics verses "human" power. The most common rear tire diameters for manual wheelchairs are 22, 24, and 26 inches for adults. Tire sizes for pediatric wheelchairs and power wheelchairs are smaller. Many manual wheelchairs are equipped to support only a couple different wheel diameters. The most appropriate diameter is determined by how long your arms are and how high (or low) you sit in your chair. You should be able to easily reach the entire upper half of the pushrim without bending forward, without hunching your shoulders, and without flexing your elbow too far outward. Frog Legs Suspension Casters place a polymer shock absorber at the point where the most vibration occurs. The front tires on a wheelchair are generally referred to as casters and are necessary for steering and maneuvering the wheelchair. Smaller casters provide for greater foot clearance and agility but are more apt to get stuck in bumps or cause forward falls. They are often found on high performance, ultralight and sports wheelchairs. The smallest casters available for manual wheelchairs are approximately 3 inches in diameter and are the same kind used on most "in-line" skates. Casters are found to be as large as 8 inches in wheelchairs designed for daily use. 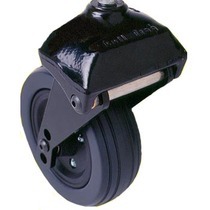 The larger casters can provide you with more security since they wheel over changes in surface height more easily. Like the rear tires, casters can be either pneumatic or solid (usually made of polyurethane). The polyurethane casters are durable but don’t offer you as much comfort as the pneumatic tires. Replace outer tire 6-9 months when tread appears worn or cracked. Cooper, RA: Wheelchair selection and configuration. New York, New York: Demos Medical Publishing, Inc. 1998: 371-396. Karp, G: Life On Wheels: For the Active Wheelchair User. 25 August 1999. From excerpt.